Now we don't recommend you doing this with your own white handset, but the Sony Xperia S is supposed to have apecial dirt-repellant nanocoating to fend off the grease of this world aiming to stick onto its pretty little shell. We had a black review unit, and we noticed that stains from your fingers actually stayed for quite a long time on the matte plastic back, until they fade out, like with soft-touch plastic, but the white version shouldn't suffer much from that. 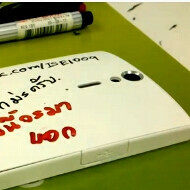 What it can suffer from, though, is someone writing with a marker pen on it to prove a nanocoating point, and that's exactly what a white Xperia S has been subjected to. The owner then grabbed a regular eraser, and removed every last bit of marker writing from the back, depriving the phone from its newly-acquired individuality. Brave souls out there, indeed, but as someone rightfully points out in the comments: "other people just used a wet cloth". Watch the Xperia S desecration in the video below. this is great.. it's like cell phone post it notes! Now, if you need to remind yourself of something, just write it on the back of your phone! sony has a new patent.phones can be used as a whiteboard for messages.now brands fight for this patent.